Hello chocolate lovers! The recipe I chose this week is from Open Source Food. It is a site where you can browse, create and share recipes. 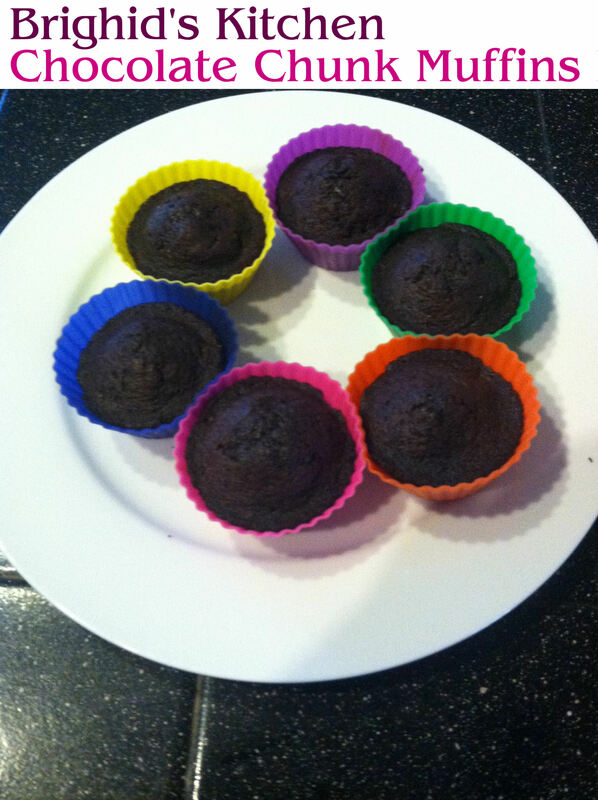 It is from user Marianne 49 and it is called Chocolate Chunk and Chip muffins. I chose this recipe because I am a chocoholic. If there was chocolate flour, I would use it! 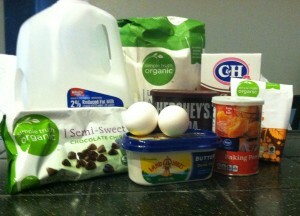 I decided to use organic white flour, organic chocolate bar and organic chocolate chips. I was asked to write this blog and make sure I sounded like an every day woman and not a professional chef. There is nothing closer to the truth. I had a blast making this recipe because there are so many human moments in the process! First of all, I noticed the recipe was written with European measurements. A normal person may have converted all the measurements before they started, but I was referring to Google as I went along, thus adding about 10 minutes to my prep time. I took pictures as I went along and realized the ingredients I forgot! Where do the eggs go? Oh yeah, cocoa powder is a dry ingredient! For some reason the semi sweet chocolate bar was a pain to break into pieces. Eventually I got it all together. 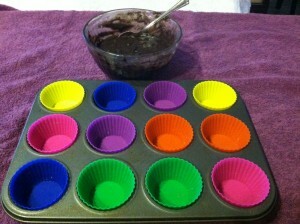 I prepared Brighid’s Silicone Muffin Liners by applying cooking spray. I feel like I overdid it a little and maybe should have wiped them down, but oh well. I set the timer for 25 minutes at 400 degrees. 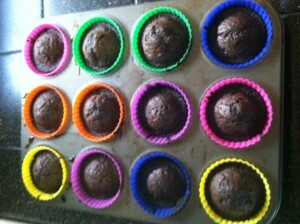 After 20 minutes I checked on them I stuck a fork in a muffin and it came right out of the baking cup! I decided to give them a few more minutes and then let them cool. I took a couple muffins and slid them right out of the Brighids Silicone Muffin Liners. None of the muffins stuck at all. The muffin itself tasted pretty good and now I need someone to eat the rest! Cleanup of Brighid’s Silicone Muffin Liners are a breeze! Much easier using the cooking spray. I really enjoy cooking with these because of their functionality and they are just so colorful! I look forward to the next recipe and see if I have as much fun a I did this time. 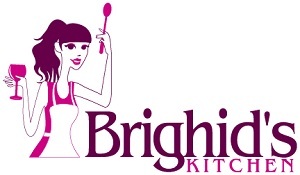 Want to purchase your own Brighid’s Kitchen Silicone Baking Cups? Just sign up for the mailing list on the right to get a coupon for 20% off, or go directly to Amazon.com and buy now! 1. Mix melted butter with milk, Add egg to sugar and beat to dissolve and mix with butter mixture. 2. Sieve the dry ingredients and add to wet ingredients. 3 Mix to blend only. Add chocolates. Brighid’s Kitchen is starting up a new monthly giveaway. Every month we will give away one $50 Amazon gift card and a coupon to get one of our products for free! 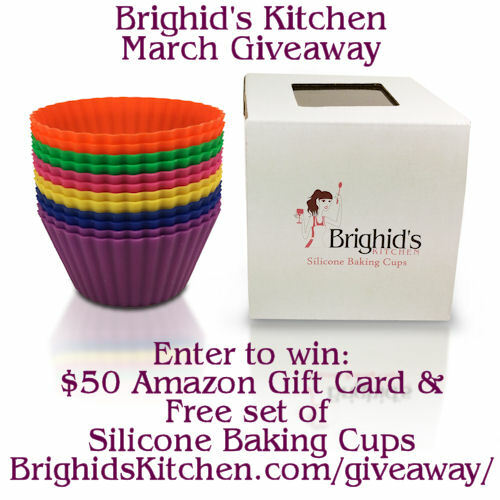 March’s giveaway will be for one $50 Amazon gift card and a coupon to get a set of 12 Brighid’s Kitchen Silicone Baking Cups for free. Disclaimer: No purchase is necessary to enter. Void where prohibited by law. The odds of winning are based on the number of entries received. Open to US 18+ only. Confirmed Winner(s) (by Rafflecopter) will be contacted by email. Winner(s) have 48 hours to respond before a new winner is chosen. This event is in no way administered, sponsored, or endorsed by, or associated with, Facebook and/or Twitter, Google, or Pinterest.